Go from darling doe to bambi babe in this fawn-tastic 3 PC Darling Deer costume. 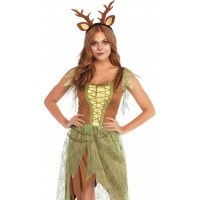 The fur trimmed off the shoulder bodysuit features an adorable furry fawn tail, and the costume includes removable clear straps and a matching deer antler headband. Pair with other deers for the perfect herd or maybe find a skunk friend for a fun BFF costume! Item Number: LA-c86725 | Approximate Size (Inches): 8.00 wide x 1.00 deep x 12.00 high | Approximate Shipping Weight: 2.00 lbs.